AME800 is complete mattress replacement system that sets a new standard for the ultimate in pressure relief surfaces. 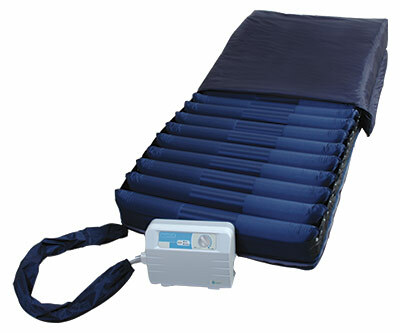 The AME 800 features 20 individual high strength air cushions, which are enclosed in a durable containment system. For added patient protection these cushions rest on a 2” covered foam safety pad. The 800 comes with a quilted top cover, which is waterproof, vapor permeable and completely machine washable. The purpose of the AME 800 Mattress System is to provide therapeutic benefit to patients at risk or suffering from pressure ulcers. The active component that has contact with the patient is a specialized, multi-cell air mattress sized to fit a standard medical bed frame. The air mattress serves to replace the original mattress and is equipped with 2 air hoses with connectors that mate with the Air Pump/Control Unit. The Control Unit is a self contained, totally enclosed module that hangs by retractable hooks on the bed frame at the foot of the bed or sits on the floor under the bed. It is provided with a hospital grade electrical cord and a control panel that has selector switches and indicator lights. The switches and indicators are protected under a flexible membrane to keep out liquid spills and enhance clean-up and sanitation. Inside the Control Unit is an air pump, valve motor and air valves that allow the air mattress to operate in cyclic pressure variations. The Control Unit has two user replaceable fuses near the power switch. The fuses are rated at 250 Volts, 1.0 Amp. Remove the products from the packing material and examine for shipping damage. If damage is detected in shipping, contact the freight company and file a damage complaint immediately. Secure Air Mattress to the frame with straps provided. Make sure the power cord is plugged into a properly grounded A/C 110 Volt outlet. 1) Remove standard mattress from the bed. 3) Strap air support mattress to bed frame on all four sides. 6) Check to see that the unit is turned “off’ and then plug the unit into a grounded A/C 110 volt outlet. 7) Turn master power switch to the “on” position. 8) The Low Pressure yellow LED light indicates that the air mattress is not fully inflated. Press the Alarm Reset button to mute the alarm. When the pressure is reached, the Normal Pressure green LED will come on. Press the Alarm Reset button again to reactivate the alarm. 9) Turn the dial to the firmest position for overlay mattress inflation. The mattress will take approximately thirty minutes to air up with the pump. 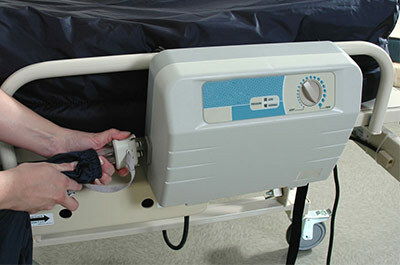 10) Place the patient on the overlay mattress after it is completely inflated. 11) To set comfort level, turn the dial to corresponding setting for a firm or soft mattress. 12) Press the Static/Alternate button to switch between static and alternating modes. The LED will light up in Static mode. b. Twist CPR plug on the mattress to open it. c. Remove the hoses from the control unit. Notice: The mattress is equipped with a 2-inch foam pad in the mattress base for patient support.